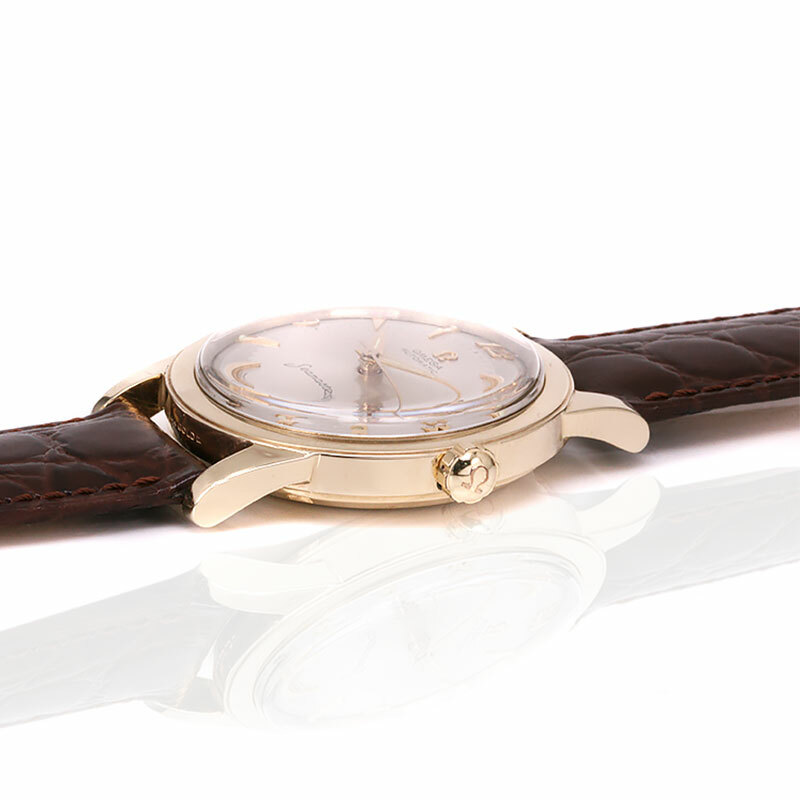 Product code: W1518cc Categories: Omega Watches, Watches. Here is a very rare 14 carat vintage Omega Seamaster made in 1956 that has so many unique features to it. Firstly the 14 carat yellow gold case was made under licence to Omega by Lutringer & Kammerer of New York. This company made watch cases for watch companies such as Waltham, Longines, Hamilton, Heuer and of course Omega. Watches that were made overseas were subject to a high tax, however if the watch movement only was imported into America, then this would be exempt from this tax. The case measures 34mm across plus the Omega crown and the bezel and lugs have such a lovely sleek look and feel to it that make this watch perfect for day or night. The dial is also just as attractive with the combination of triangular index markers so indicative of the 1950’s, as well as the 12,3,6 and 9 numerals with their lovely font. Combine this with the centre seconds, and it results in a very stylish vintage Omega watch from the 1950’s. Inside the watch is a calibre on Omega that is extremely hard to come by – the 17 jewelled automatic Omega calibre 500. Whereas there are many 501,502,520 calibres to name but a few, to find an early Omega calibre 500 is incredibly hard to come by. 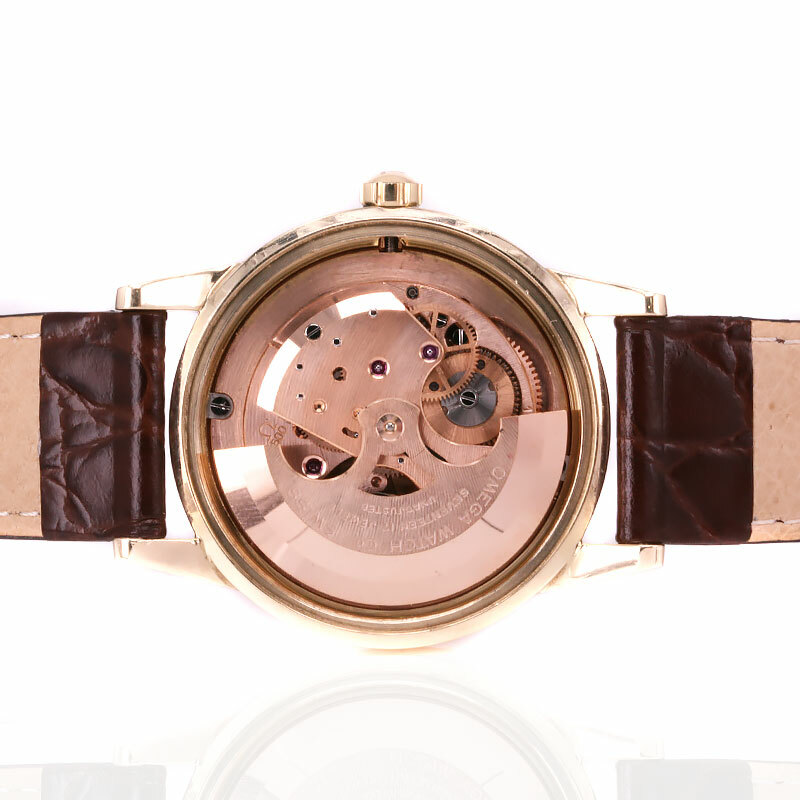 Not only is this a beautiful movement to admire, it runs perfect and comes with our twelve month warranty. And then there is the overall condition of this watch which is just incredible to admire, especially considering that it was made over 60 years ago – the condition of the case, dial and movement are as good as you could ever hope to find, and adds to the charm and character of this very beautiful Omega Seamaster. The Omega Seamaster is such an iconic watch, and this is just a magnificent example to admire even more so when it is on your wrist. Tags: Omega, Omega Seamaster, Omega Seamaster watch. A brief history of the Omega Seamaster. First released in 1948 which was also Omega’s 100th Anniversary, the Omega Seamaster was designed to be a robust watch while still being very elegant making it one of the world’s first watches that could be worn with a suit and tie as well as a wet suit in an age where blue collar watches and white collar watches never overlapped. The Omega Seamaster was in fact born as a result of World War II where the British were after a watch with superior reliability and water resistance with very high precision. After the war the Omega Seamaster became known as the watch to have on your wrist and one that would never let you down, and is a testament to the classic vintage Omega Seamaster watches that we have on offer.